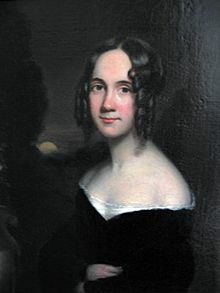 Sarah Josepha Hale (October 24, 1788 – April 30, 1879) was a 19th century American writer and magazine editor. She wrote the poem "Mary Had a Little Lamb". She campaigned to make Thanksgiving a national holiday, to make Mount Vernon a national shrine, and raised funds to complete the Bunker Hill monument. Hale was born in Newport, New Hampshire to Gordon Buell, a Revolutionary War captain, and his wife, Martha (Whittlesay) Buell. Sarah married lawyer David Hale in 1813, and bore him five children. Widowed in 1822, Hale entered the literary field in order to support her children. In 1827, she published Northwood: A Tale of New England. It was one of the first novels to be published by an American woman. She edited Ladies' Magazine in Boston, Massachusetts, then moved to Philadelphia, Pennsylvania in 1837 to edit Godey's Lady's Book, the premiere woman's magazine in America. She edited the magazine until 1877. She died in 1879. Hale raised funds for the completion of the Bunker Hill Monument. She urged the Federal government to make Mount Vernon a national shrine, and to declare Thanksgiving a national holiday. Grave of Sarah Josepha Hale in Laurel Hill Cemetery. Sarah Josepha Hale Facts for Kids. Kiddle Encyclopedia.